On the Edge is a "small" film–it’s short at 87 minutes, has just four characters and very little plot. 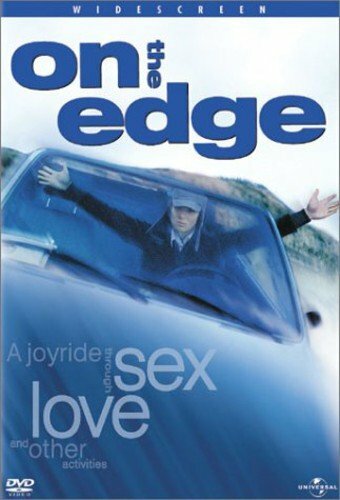 Jonathan Breech (Cillian Murphy) loses his Dad, gets high, and drives a stolen car off of a cliff. Surviving with just a broken pinkie (a silly stab at humor), he has a choice of prison or a mental hospital and chooses the latter. The location is Dublin, Ireland. At the hospital he befriends Toby (Jonathan Jackson), who is riddled with guilt, blaming himself for the accidental death of his brother. They easily slip out of the hospital at night to go drinking and rather recklessly look for trouble. The love interest is Rachel Row (Tricia Vessey), who is suicidal and, in one disturbing scene, indulges in self-mutilation. All are under the care of Dr. Figure (Stephen Rea). Presumably because comedy sells, On the Edgeis marketed as such, but humor is not its strong suit — viz: the pinkie business. The Breech character does have a sense of humor which he uses as a powerful defenseagainst the things that haunt him and some of his lines are funny indeed. But they’re lines covering up rather profound insecurities, so even when there is a laugh, it’s got a downside tilt to it. Murphy, a Dublin-based actor, gives a strong performance, managing to deliver the irony-laden attitude and defensive posturing of the troubled adolescent while letting some real warmth shine through. He finds a balance between the rebellious side and a gentle sweetness of heart; he lets the vulnerability show through the veneer of toughness. His portrayal centers the film. None of the other characters is as fully developed. Jackson (Insomnia, Skeletons in the Closet) has one major scene in which Toby opens up to Jonathan. He achieves the required intensity and is genuinely sympathetic; that his Irish accent is less than accomplished doesn’t get in the way. Vessey (Trouble Every Day, Ghost Dog) is disturbed and quirky as Rachel, but her character is never really explained and even the hint of a suggestion that being loved by Jonathan will trigger her recovery seems facile. Rea has the least to do–the head shrinker as ever-patient passive listener. His performance is so understated that it lacks any presence at all. The soundtrack uses contemporary rock music which underlines the emotions of the moment; at various times during the film scenes are extended while the music dominates and effectively compliments the drama. In short, this is pretty thin material and it is not unflawed. At the same time it doesn’t put on airs; it’s lack of pretension makes it easier to accept on its own terms. Murphy’s characterization has both edginess and charm and it carries the film. He’s a young actor to watch.